An official inauguration of a monument to the International Brigades was held in front of the Austerlitz train station in Paris on October 22. This was the place where the International Brigaders rode trains to Spain 80 years ago. Among crowded participants (French, Swedish, Danish, Russian, German, Dutch, Italian, Canadian, Polish, USA, UK, Puerto Rico, Romanian, etc. 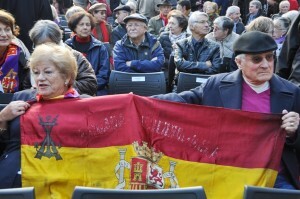 ), there was Vicente Almudever (98 yrs), who is the brother of the Brigader Joseph Almudever (97 yrs old). Among all the speeches given, Claire Rol-Tanguy, President of A.C.E.R., received lots of applause. The monument was unveiled by Cecile Rol-Tanguy. Cecile and Claire are the wife and daughter of Henri Rol-Tanguy, a French IB Commissar, respectively. The inauguration event was organized by the Mayor of Paris and SNCF and A.C.E.R. To see a slide show of the Paris monument inauguration, click here. To see a slide show of the celebration at Benicàssim, Spain, on October 24, click here. For a slideshow of the two anniversary events at Albacete on October 25– the inauguration of plaque commemorating arrival of the International Brigades 80 years ago, and a formal welcome to delegations at the Diputación Provincial de Albacete — click here. On October 26, we were welcomed by the Mayor of Madrigueras, where IBers received military trainings in the Spanish Civil War. Each delegate was presented with a gift and a bunch of flowers. The program included a series of presentations, such as a slide show of drawings left by the IBers and a talk by an author about IBers in Madrigueras, etc. The drawings unfortunately were removed by a priest from the church in 2005. After posing a group photo with the Mayor in front of the town hall, we were led to an exhibition of IBers in Madrigueras. The Mayor escorted us all the way to the edge of the town and bid us farewell. Here is the link to the photos we took.